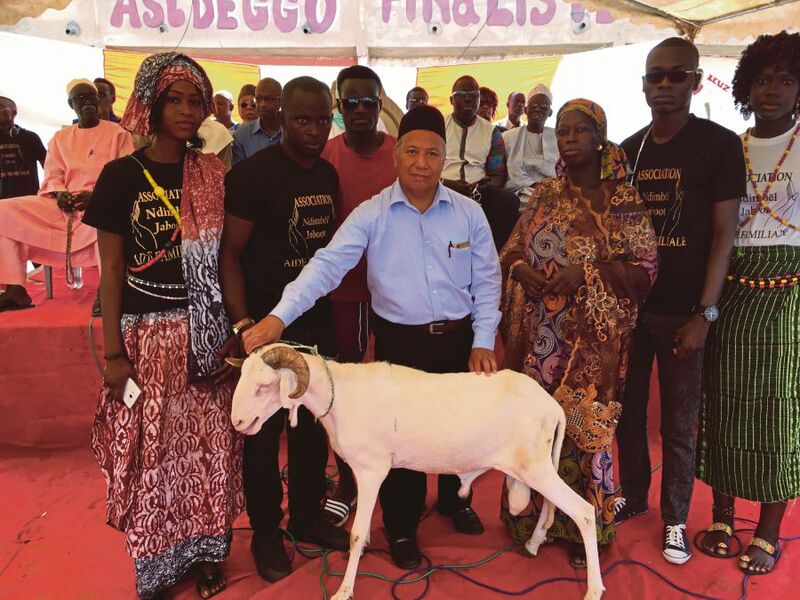 Noor Habibullah Md Nasir (in songkok), the personal assistant to the Malaysian ambassador to Senegal, holding the sacrificial goat at the handing-over ceremony. ONE wonderfully interesting thing about travelling or living abroad is the chance to experience the vibrancy of different cultures, languages, and customs. Every village, city, and country seems to have its own way of celebrating festivities, even if those festivities are common to another group. Take the Aidiladha celebrations, for one. In Malaysia, we wish family and friends “Selamat Hari Raya Haji”; it is “Eid-ul-Adha” for many in the English-speaking world, and here in Senegal, it is known as “Tabaski”, from the Wolof language of the tribe. All of us know that the origin of Eid-ul-Adha and how on 10 Zulhijjah, the 12th month of the Islamic calendar, Muslims all over the world offer a sacrifice in the form of a sheep, goat, ram, or cow, with a portion of the meat distributed to the needy in the land. The date of Eid also coincides with the end of the haj in Makkah, where pilgrims have been observing the rites of the pilgrimage. But other than that which the Eid-ul-Adha signifies, there are many cultural differences as to how the Eid is celebrated in Malaysia and Senegal. Firstly, Tabaski is the major Islamic celebration for Senegal, as it is for some parts of the world, including Saudi Arabia. In Malaysia, the major celebration is Eid-ul-Fitri, which signifies the end of the Ramadan. And because Tabaski is celebrated in a big way, most Senegalese would head to their hometowns for the family feast. In this, they are similar to Malaysians, where a friend told me that this year’s “balik kampung” started on Friday the week before. Almost nothing gets done before and immediately after Tabaski, which as a Malaysian, I can fully empathise with since it is also the practice in Malaysia. The second difference is that the goats or sheep are bought in advance of Tabaski, and then housed at home before being slaughtered. In Malaysia, we pay companies and associations to purchase the animal, and never take it home with us, at least not while it still moves. Third, these sacrificial animals in Senegal are slaughtered by the families themselves. In Malaysia we often do it at the mosque or at a designated area, and it is always a communal thing rather just one family’s effort. Finally, for the Senegalese, as long as you draw a salary or have a means of income, it is incumbent upon you to carry out the sacrifice, unlike our practice in Malaysia. So many goats are required for the slaughter on Tabaski that even goats from Mauritania are brought in to fill the demand. The Senegalese know which are the local well-reared goats, and which are those from neighbouring countries — by the time the goats reach Dakar, they are thin and tired from walking. This year, the Malaysian embassy in Dakar decided that it would assist a local charity, the Ndimbel Jaboot, raise funds for goats to feed needy families on the outskirts of Dakar. After a short hesitation, funds poured in from Batch 89 of Sekolah Seri Puteri, and from the Idid clan in Kuala Lumpur, enabling the embassy to purchase 13 goats for distribution. Last Monday, Aug 20, the charity association held a ceremony in Guinaw Rail South commune in the Pikine district, 12km outside of Dakar. Despite not meeting its original target, the association’s president, Ngagne Mary Sebore, was pleased that they had managed to raise enough funds to cover 100 goats, including the 13 from the embassy. The ceremony was attended by mayor Abdoulaye Diop of the commune, the Grand Imam of Pikine and three other imams in the area, as well as the families who were to receive the goats. And of course, the embassy participated as its guest of honour. Once they found out that the donations were from ordinary Malaysians who were reaching out to the Muslim families in Senegal, the ceremony took on a special significance, as it did to the embassy staff present. Joy was evident on the faces of these families as one by one they conveyed their gratitude to the proxies. Malaysia might have been more than 10,000km and a cultural chasm away, but just at that moment in time, Malaysia was perhaps closer than ever before to the people of Senegal. An Eid by any other name can be just as meaningful.